You absolutely can’t go wrong with a wine tour of the Rhone Valley! This fascinating region offers striking heritage, including the UNESCO city Lyon with its simply fabulous gastronomy, world-renowned “bouchons” (typical bistros) offering sublime cuisine from prime, locally sourced ingredients, not to mention the almost endless list of exquisite wine regions; Crozes-Hermitage, Châteauneuf-du-Pape, Côte Rôtie, Condrieu, to name just a few, this really is wine lovers paradise – there is so much to discover. The region is diverse in terms of landscapes and soil types, extending over 200km from Vienne (just 30km South of Lyon) to Avignon. The wine regions are very distinctively split into the Northern Rhone, where oak forests and fruit trees surround the vineyards and the Southern Rhone where olive trees and herb shrubs become more and more dominant the further south you travel and you near Provence. There is no lack of sunlight, so red wine is clearly king, representing over 90% of the production. Cellar Tours prepare tailor-made tours which go beyond the expectations of even the most demanding gourmand and wine connoisseurs. Imagine dining in charming Bouchon and top-notch Michelin starred eateries, visiting and enjoying private tours and tastings at famed chateaux, relishing the most divine chocolate at Valrhona, City of Chocolate, with the perfect amount of time dedicated to digestive strolls, sightseeing, and cultural discoveries. Your private chauffeur and luxury Mercedes will collect you at Lyon airport this morning. Head into the beautiful old town, Vieux Lyon. Enjoy a Rhone wine masterclass before lunch at a quaint cellar with a famous local sommelier, tasting 6 flagship wines from Northern and Southern Rhone. This is a great introduction to the places you will be visiting and will give you an introduction to the variety of wine styles of this extensive region. Welcome lunch then at Daniel and Denise Saint-Jean, an authentic Bouchon (typical Lyonnais bistro) in the heart of the Renaissance UNESCO listed quarter of Lyon. This is an awesome place to get a real feel for traditional Lyon cuisine, Chef Joseph Viola creates divine Lyonnaise dishes of very generous portions, served by the most attentive, professional waiters in the adorable dining room, which naturally features all the typical “Bouchon décor”; red-checked tablecloths, copper pots, and pans, wood-paneled walls, and a striking zinc-topped bar. 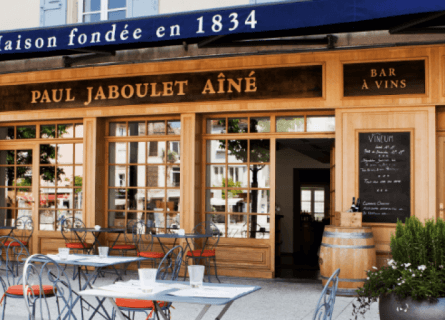 You will enjoy savoring the likes of; Lyonnais sausage encased in brioche, Farm-raised AOC Bresse chicken with morel mushrooms, Saint Marcellin cheese from the famed “Mère Richard”. 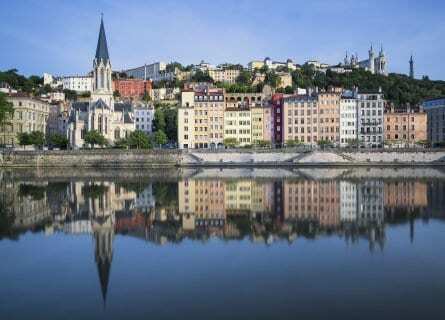 After lunch, enjoy a Walking Tour of Lyon to clear the head and perk you up. Lyon old town or “Vieux-Lyon” as it is known locally is one of the largest old towns in France, remaining almost intact, and although it’s existence has been threatened over the years for sanitation reasons, has thankfully been immaculately preserved. Split into 3 districts named after saints, the name of whom a church or the cathedral in each district is called; St Paul, St. John and St. George. All of which are striking buildings in their own right and worth a visit. “Cathédrale Saint-Jean” St. John’s Cathedral has a beautiful grandiose façade, although appears somewhat “short” due to the fact that its towers are actually unfinished. The cathedral houses the 14th century Lyon Astronomical clock, truly remarkable to see. (If you happen to be visiting in December the light festival is very pretty). The view of the city from the Basilique Notre-Dame de Fourvière is stunning and worth the climb. You will then settle into your immaculate and utterly delightful hotel, the Cour des Loges, enjoy a free evening to relax or catch up on jet lag. Hit the wine country today! At 10 am your chauffeur will collect you for about a 30-minute drive south to visit the fabulous Domaine corps de Loup, family run with lots of passion, predominantly focusing on Syrah and Viognier, you will taste elegant examples of Condrieu, Saint-Joseph, and AOC Côte-Rôtie. Then on to Lunch (just another short 30 min drive) where you will delight in a gourmet extravaganza at La Pyramide. This gastronomic restaurant by Patrick Henriroux proudly holds 2 Michelin stars and is absolutely sublime. A complete contrast to yesterday; here you are greeted by a much more modern contemporary affair, from the décor to the food. An intense sensory experience; discover the infinite array of color, aromas, tastes, and textures that can be relished with wines from their exquisite collection. After an outstanding lunch, head to the historic city of Vienne, to stretch your legs, see the Ancient Roman theatre and more. This city is full of Roman architecture, probably the most impressive is the Temple in the heart of the city, almost completely intact and dating back to the 1st Century or the all imposing, truly magnificent amphitheater from around 40-50 AD, which sits at the foot of Mt Pipet. It’s quite a site and incredibly large, seating over 11,000 spectators. It is still used today during the summer Jazz festival. 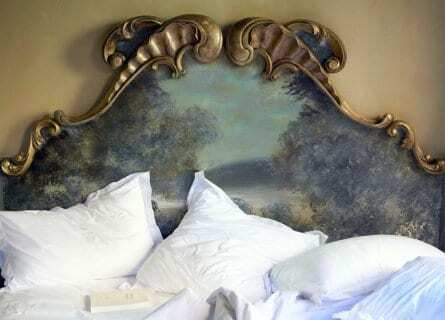 Then on to your elegant Relais & Chateaux hotel, Maison Pic. You won’t be terribly hungry for dinner. A free evening to explore your captivating abode, impeccably decorated in a contemporary style, be sure to check out the enchanting gardens. Make the most of a leisurely breakfast, before your chauffeur will collect you. It’s just a 20-minute drive to your first port of call; the renowned Chapoutier. These guys have been knocking out sensational wines for over 200 years and produce outstanding examples in Hermitage, Côte Rôtie, Châteauneuf-du-Pape, Saint-Joseph, Crozes-Hermitage, and Luberon. The utmost importance is given to the viticulture, all their vines being nurtured using organic and biodynamic practices with total respect for the terroir. Your tasting will most likely include; Le Meal (Ermitage Blanc), La Mororée (Côte Rôtie), Le Pavillo (Ermitage Rouge) and Croix-de-Bois (Châteauneuf-du-Pape). Next up is a tantalizing wine lunch at Jaboulet Vineum. A heavenly lunch venue as passionate staff including the knowledgeable sommelier guides you through their seasonal menu perfectly paired. Depending on when you visit specialties may include their sensational snails or melt in the mouth pigeon with thyme. After lunch, stroll through the vineyards up to Chapelle de l’Hermitage with a local wine expert and enjoy a vineyard walk that concludes with a private tasting at a secret gem in the Hermitage appellation. Then chocoholics brace yourself because next up is a visit to the mythical Valrhona Boutique in Tain l’Hermitage, the “Rolls Royce of Chocolate”. Discover everything you ever wanted to know about chocolate from the bean to the bar and pick up some fabulous gifts; before heading to your gourmet hotel for a blowout dinner onsite at their 3 Michelin star restaurant. This restaurant has a fascinating history dating back to 1889 and has gained, lost and regained its stars a number of times over the years. Prepare yourself for some electrifying creations such as Gillardeua Oyster with lovage and black cardamom ice cream and various beetroot textures or Duck Liver Crème Brûlée topped with green apple sorbet, there are a generous selection of sweet delicacies with which to finish including “Bitter Honey Chocolate” (just in case you didn’t sample enough this afternoon) this treat was created by Valrhona for Anne-Sophie Pic and is like a honeycomb served with Corsican bitter honey pannacotta cream and Hojicha Cubeb tea ganache – bliss! Visit historic Vaison la Romaine this morning, this fascinating city at the foot of the Dentelles de Montmirail Mountains only received its full name in 1924 when the extensive Roman ruins of the city were discovered. Unveiling the truly splendorous life of Roman high society. 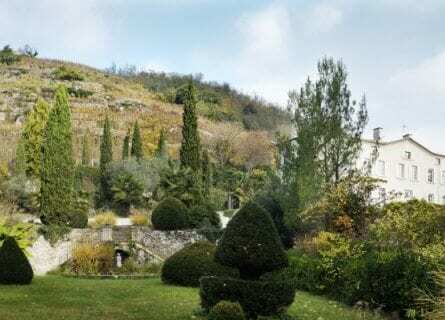 The city is split geographically by the river Ouvèze; on the left bank, the “high town” as it is called as it clings to a steep hill, is well worth the effort of the climb for nothing more than the breathtaking panoramic view from the top. Stroll around the cobbled streets and maybe grab a coffee in one of the picturesque squares. Your chauffeur will then take you on to the captivating Chateau Saint Cosme in Gigondas for a private tour and tasting. Probably the most ancient estate in the region and steeped with history. The terroir in the Gigondas region is unique, over 600m above sea level, at the foot of the Dentelles de Montmirail. Here big, ripe, full-bodied reds dominate and you will sample fantastic examples here at Chateau Saint Cosme. Lunch follows and is a characterful affair at L’Oustalet in Gigondas, totally embracing the wine world in which it finds itself, this delightful restaurant set in an old stone house has its own vegetable garden, the resulting produce being used to inspire the seasonal menu. The wine list is extensive and fascinating to take a peek, but the pairings offered with the lunch menu is a great option. A little over the 10-minute drive away you will visit Beaumes de Venise next, this enchanting hilltop village, full of caves makes for an interesting digestive stroll before you will have a fun wine tasting paired with Provençal bites such as tapenade and goat’s cheese, at Domaine de la Pigeade. The Muscat de Beaumes de Venise make for an interesting change. It is a fortified wine from either Muscat á petits grains blanc or noir, so can range from an amber color to rosé or even purple. One last stop before heading to your hotel, at the stunning Domaine Montirius, this delightful family-run vineyard oozes love and harmony. You will be personally received and hosted by the owner Christine, who will introduce you to their range of wines from various appellations including Vacqueyras, Gigondas, and Côtes du Rhône. A real treat! Then a 30-minute drive to your overnight destination Hotel D’Europe in Avignon. A historic building dating back to 1580 and also one of the oldest hotels in the country, it’s been beautifully restored and renovated and boasts a prime location both near the river and centrally located. Bon Soir! This morning you will get to see if some of the Michelin starred experiences you have had over the last few days have inspired your own kitchen skills, with a fun cooking workshop. Your chef will meet you and first of all take you to Avignon marketplace, where he will help you discover and select the best seasonal produce. Once at La Cuisine de Valentine Cook workshop your chef will guide you through some authentic Provençale cooking practices and give you plenty of top tips from seasoning, cooking, serving and presenting the meal. Then once ready, sit down and enjoy the fruits of your labor, bon appétit! 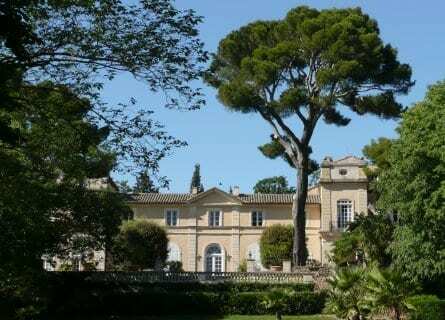 After lunch, you will have a VIP tour at the terrific Chateau de la Nerthe, this mythical chateau was built in 1736 and is mentioned in documents as far back as 1560. Not only is it probably one of the oldest estates in Châteauneuf-du-Pape, but is also famed for being the first estate of the region to export out of France. The estate changed hands a number of times, especially during the 19th/20th century. The current owners purchasing and renovating in 1986. All 13 of the permitted varieties are planted, producing 3 red and 2 white wines. You will hear the fascinating viticultural and vinification practices they use, ending with a tasting of their marvelous wines. Then before heading back to Avignon, pop into the village of Châteauneuf-du-Pape itself, a pretty medieval village perched on a hill from where you can admire the luscious vineyards. Once back at your hotel, a free evening to relax or explore with our recommendations. Today you will explore the glorious Luberon and some of its beautiful medieval hilltop villages. First stop at Domaine de la Citadelle, striking views greet you everywhere you turn here, whether overlooking the vast vineyards, up to the perched village or handsome Mountain range. 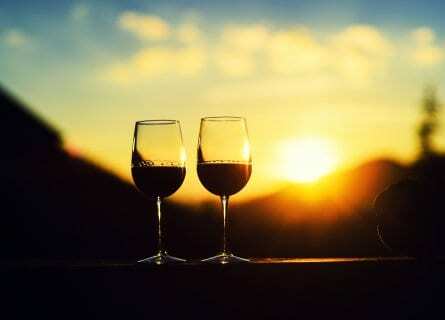 The wines don’t cease to impress, undoubtedly thanks to the careful vineyard parcel selection, state of the art winery and cellar and cutting-edge winemaking practices. You will enjoy a VIP tour and personalized tasting with your charismatic hosts taking time to visit the fascinating corkscrew museum with over 1200 corkscrews from the 17th century to today. Then on to Ménerbes; narrow streets lined with cute houses and the occasional boutique or café cling to the steep slopes that lead to the 16th century Citadelle. After admiring the most spectacular view from the top, head to the Place de l’Horloge where one of the grand, immaculately restored stone houses is home to the Maison de la Truffe et du Vin (House of truffles and wine). After a delicious lunch, naturally featuring these exquisite “fruits”, if you are visiting in truffle season, Robert, a lively local truffle farmer will take you truffle hunting, this is such fun and the ultimate French experience. 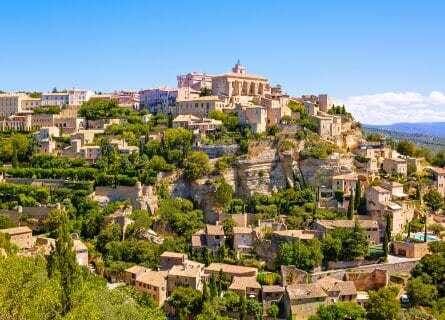 You will then visit Gordes, breathtakingly beautiful, considered not only to be the most beautiful village in Provence but in France. It is as equally striking being admired from afar as you approach it as it is fascinating to explore. Your chauffeur will also take you to the nearby Senanque abbey where the typical lavender field picture is taken. One last stop before heading back to Avignon at Roussillon; in total contrast to the white stone of the other villages, Roussillon is awake with color, a painter’s palette of color thanks to the neighboring ochre quarry, quite a sight off-set against the pine-covered hills and green valleys. Then a free evening in vibrant Avignon. Get a real feel for this striking city and enjoy a walking tour of Avignon this morning. Famous for its UNESCO world heritage Palais de Papes, the Popes’ Palace, which was home to the Pope and the center of the Roman Catholic Church for over 70 years in the 1300s. Near to the palace, the Notre-Dame des Doms Cathedral is also high on the list of “must-see”, with it’s impressive 6 meters high gold gilded Virgin Mary looking out from the top of the bell tower and protecting the city. Just as the medieval wall that surrounds the old city is wonderful to see. For a small city, it really does have a lot to offer and the picture perfect cobbled streets are lined with boutiques, art galleries, restaurants, and cafés. Simply taking a few moments to sit and watch the hustle and bustle in the vibrant squares is a real pleasure. By lunchtime, you should have “walked up” an appetite and you have a fabulous farewell lunch on the beautiful terrace of Mirande to look forward to. This is a very special finale to this gastronomic trail; the setting is stunning and each plate that is presented in front of you is a true work of art. Season dependent of course; but you can expect the likes of Partridge grilled and then lacquered with Hokkaido pumpkin chutney, Red Scorpion Fish in a saffron broth with crispy octopus or “Lemon Lightness” which is Chef Florent Pietravalle’s interpretation of a Lemon Meringue Pie – it just melts in your mouth! Then hop on the fast train to Lyon, settle into your delightful hotel in the old town. You will have a free evening to make the most of this fascinating city, with plenty of tips from us of course. After a last breakfast at your supremely romantic hotel, carry on to Lyon airport, or your next port of call or spend another day in Vieux Lyon- Bon voyage!